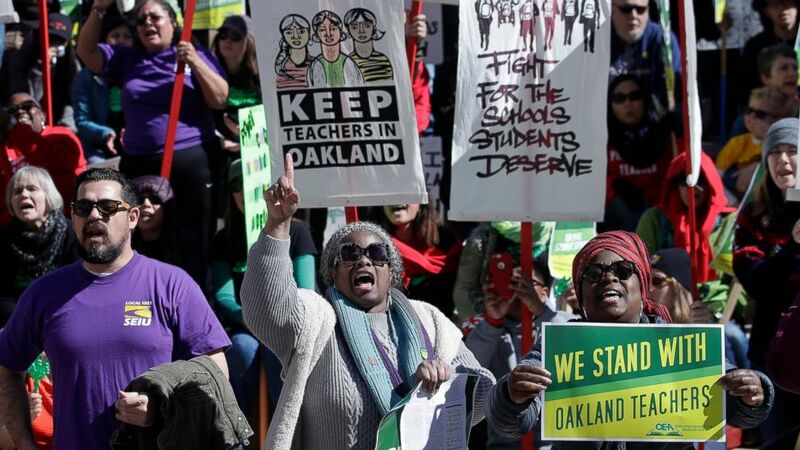 OAKLAND, Calif. – Oakland teachers will be back in their classrooms Monday after union members voted to approve a contract deal with district officials. The Oakland Education Association voted in favor of the deal on Sunday after postponing the vote for a day. Posted in Accountability, Advocacy, Arming Teachers, Bus Safety, Charter School, Department of Education, Education Budget, Educators Protest, Evaluations, Every Student Succeeds Act, Failing Schools, Funding For Education, Higher Education, Janus, Mental Health, No Child Left Behind Act, Online Education, Parents, Pension & Salary, School Closings, School Safety, Special Education, Students and Parents Protest, Teacher Evaluation, Teacher Shortage, Technology in the Classroom, Testing, Vouchers and tagged "Standing Strong for Public Education", #iBelieve, Accountability, Accountability System, Advocacy, Department of Education, Diversity, Education, Education Funding, English Language Learners, Equity, Every Student Succeeds Act (ESSA), Failing, Failing Schools, Federal Education Policy, HBCU, High-Needs Students, NEAExecutiveCommittee, Pension, Pensions, Public Education, School Choice, School Nurses, School Safety, State Budget, Students, Tax, Testing and Accountability. Bookmark the permalink.